Trump Weighs Tougher Immigration Enforcement After Homeland Security Shake-Up The Trump administration wants to toughen border enforcement and deter asylum-seekers. New figures show that more than 100,000 migrants were apprehended at the U.S. Southern border in March. With a shake-up at the Department of Homeland Security, President Trump is indicating that he wants tougher immigration enforcement. 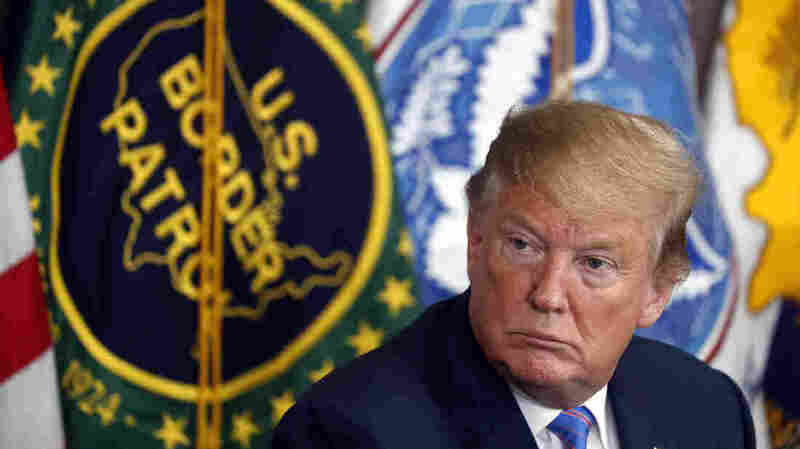 With a dramatic shake-up at the highest levels of the Department of Homeland Security, President Trump has signaled that he wants to get even tougher on immigration. But how much tougher can he get? Trump has been frustrated with the inability of DHS to stop a surge of Central American migrant families and children from crossing the Southern border. On Tuesday, Customs and Border Protection announced what it had predicted for days: The number of migrants apprehended at the border last month surpassed 103,000 — the highest level in more than a decade. The president signaled that he plans to take the department in a new direction after he accepted the resignation of Secretary of Homeland Security Kirstjen Nielsen and pulled the nomination of Ronald Vitiello to be director of Immigration and Customs Enforcement. A senior administration official said on Tuesday that the department wasn't doing enough about the border crisis or acting with enough urgency. Now the White House is discussing new steps that could be taken to slow the flow of migrants, including bringing back a version of separating migrant families at the border. Another option on the table: ramping up deportations of immigrants already living in the U.S. illegally who have an outstanding order of removal. Speaking briefly to reporters in the Oval Office on Tuesday, Trump said he is not looking to reinstate the controversial family separation policy he suspended last year but then implied it was an effective means of stemming unauthorized border crossings. "I'll tell you something — once you don't have it, that's why you see many more people coming," Trump said. "They are coming like it's a picnic, because 'Let's go to Disneyland.' "
White House officials say they are looking at a variation of the policy that gives parents more of a say in the process. The so-called "binary choice" proposal would dramatically expand immigrant detention and give parents a choice: Their children would be separated from them and later released to live with a relative or sponsor in the U.S., or the family could stay together in detention until their day in immigration court. Critics say the modified version of family separation is still cruel and is likely to be challenged in court. In addition, the White House is looking at a stricter screening process for asylum-seekers that would make it tougher for them to pass the first stage of the process, the credible-fear interview. Most migrants are able to convince an asylum officer that they have a credible fear of returning home, and they are released to live in the U.S. while their case plays out. But Trump faces some major head winds. While the White House has been pushing Congress to change immigration law to make it easier to detain and deport asylum-seekers, Congress doesn't appear ready to take up the immigration debate, and previous attempts under Trump have failed. Similarly, Trump frequently returns to his wish list — a border wall, ending policies that make it easier to bring family members to the U.S. and stopping the green card lottery. But those proposals have all languished. Moreover, many of the actions that the Trump administration has taken on its own have been blocked by the courts. On Monday, a federal court in Northern California temporarily blocked the "Remain in Mexico" program, which forced some asylum-seekers to wait in Mexico while their claims were pending in U.S. immigration court. — Change the rules so that migrant families can be detained indefinitely while their immigration cases are adjudicated. Build tent camps along the border to house them because there is not enough room in ICE detention facilities. Currently, there is a limit on how long children can be held in detention, and critics say DHS had been slow-walking efforts to change that. — Flood the border zone with asylum officers, immigration judges and ICE attorneys. This would allow officials to put asylum-seekers on a so-called rocket docket. Most asylum claims are ultimately denied, so this would speed that process, which can take years given the current backlog of hundreds of thousands of cases. — Focus on deterrence. This would include returning to a version of family separation, rebranded as a "binary choice." Overall, the endgame would be to convince Central American migrants that it's no longer a good idea to cross the border without authorization. R.J. Hauman is government relations director at the Federation for American Immigration Reform, which advocates for strong immigration enforcement. Hauman says Trump has "an opportunity to correct the sins of his administration." He said Nielsen, whose specialty is cybersecurity, was a "neophyte" on immigration and didn't champion Trump's agenda. Mark Krikorian is the director of the Center for Immigration Studies, another organization that promotes tighter immigration rules. He also advises the president on immigration policy. On NPR's Morning Edition on Tuesday, he said the most pressing issue facing DHS, a sprawling department, is immigration. "[Nielsen] came to appreciate the urgency to respond to this developing emergency on the border but much too late," Krikorian said. "She had to go. We really need a new approach, a more serious and urgent approach to deal with this developing emergency." On Monday, outside her home in Virginia, Nielsen said that she was working to ensure a "smooth transition" and that she shares the president's goal of securing the border. "I will continue to support all efforts to address the humanitarian and security crisis on the border," she said. Nielsen's last day is Wednesday.